The Oda Foundation is a non-profit, non-partisan, non-political charitable and educational organization. Contributions to The Oda Foundation are presumptively deductible from federal income taxes as charitable contributions. Please support the Oda Foundation as we seek to empower communities in Nepal's remote regions through health and education. Your generous contribution will help the lives of some of the most in need people in the developing world. 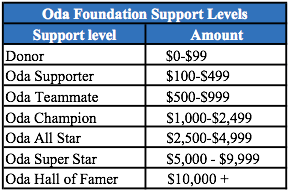 The Oda Foundation is a non-profit, 501(c)(3) organization – all donations are tax deductible. A receipt for your tax records will be emailed to you. We make a significant impact despite our modest budget and humble beginnings. Our low overhead means the vast majority of your donation will directly impact the communities we serve. For more information about our budget, see our financial statements.